If you’ve never had a driver’s license, you must begin with a beginner’s permit. You may drive from 6 :00 AM to midnight if a licensed driver who is at least 21 years old with at least one year of driving experience is in the front seat with you. After midnight, you must be with a licensed parent or guardian. You must hold your beginner’s permit for at least 180 days before you apply for any type of license. Application can be made on the 181st day or anytime there after. 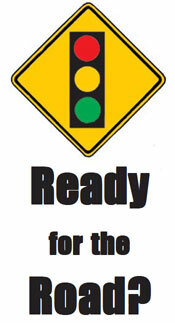 You may drive alone only during daylight hours, from 6:00 AM to 6:00 PM or to 8:00 PM during daylight savings time. After 6:00 PM, or 8:00 PM during daylight saving time, until midnight you may drive if you are accompanied by a licensed driver who is at least 21 years old. If you drive after midnight, you must be accompanied by a licensed parent or guardian. You cannot transport more than two passengers under the age of 21 unless you are with a licensed driver who is at least 21 years old. The only exception is if you are transporting family members or students to and from school. You must wait two weeks to re-test if you fail the skills test on the 1st or 2nd attempt to pass. You must wait 60 days if you fail on the 3rd or subsequent attempt before being re-tested. Ask the Price Driving School Instructor for more information. interfere with your school or work activities. You must be 16 years old to request a waiver. See the Instructors at Price Driving School for more information. your full driving privileges because DMV will mail you a special driver license sleeve that you must keep with you when you are driving.